The latest issue of Pure Green Magazine is out and it features a home well loved by readers of The Marion House Book. I'm sure you remember Rachel and Paul's Hello! Neighbor tour of their whimsical country home filled with vintage and flea market finds. I love how different the house looks in these photographs. It's a testament to the crafty skill and decorating prowess of the homeowners. There is honestly so much to feast your eyes on in this space. For more images of Paul and Rachel's house plus other great features, visit Pure Green to see a sneak peek of the new issue or subscribe to the magazine here. If you live in the Toronto area, you can pick up an issue at Coriander Girl in Parkdale or at Love the Design in Leslieville. Or check out this complete list of stockists. By the way, if you love Rachel's aesthetic you should stop by her recently opened store in Orono, Sunday's Child. 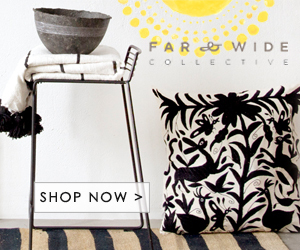 It features a selection of vintage goods hand selected by her and her partner Jude Allison. Even better, the store also offers hands-on workshops where she and other experts will help you craft, knit, sew, crochet, felt or hot glue your own creation. If you live in the city, make a day of it. It only takes about an hour to drive to Orono from Toronto. Spend the day strolling the numerous vintage stores on the Main Street and then book yourself into a workshop at Sunday's Child. I can't think of a better way to spend a winter's afternoon!